This website will serve as an informational resource on environmentally appropriate ways to manage a variety of pests. This site will focus on explaining concepts important to successful biological control implementation and connecting you to resources that will help you enrich your skill set in the art and science of biological control. There is a lot of information that is widely available on the internet, but here you will find only what is practical, useful, doable, and validated by good science. Use the drop down menus above to navigate to all of the major components of biological control, including its history, the types of organisms used in biological control and the basics on its methods. Ecological concepts are also important, as biological control is considered to be applied ecology. Note to all practitioners of biological control: make sure you have regionally appropriate information and expectations. What is useful and effective in Michigan may not be in California. Having said that, the information on this site is central and southern California biased. Natural Control is a concept identified by entomologists who developed the scientific discipline of Biological Control as something distinct and highly under appreciated. Natural control refers to the activities of all organisms in the upper trophic levels that feed upon the primary consumers (herbivores) and maintain population balance without any human influence. It is basically one way to say everything gets eaten by something; it's how nature operates 24/7. There are myriad forms and taxa that comprise the ﻿upper t﻿﻿rophic levels﻿. They are generally referred to as predators and they are constantly feeding upon their prey. Without them, all life would be wildly out of balance and spiral chaotically to extinction due to over consumption and environmental collapse. Biological Control, in contrast, is the human-directed pest management approach that mimics natural control in an effort to restore balance to ecosystems in which available resources have benefited certain herbivorous species such that their populations have grown out of control and negatively effected the human condition or interests. The above definition focuses on plant pests, especially those plants that benefit humans as either food, shelter, ornamental, or "native" species. However, biological control is not limited to the control of plant pests such as aphids, but can include control of plants that are considered weeds, or plant pathogens, or insects/arthropods that are of medical or veterinary importance such as mosquitoes. The official definition of biological control: The use of populations of natural enemies (parasitoid, predator, pathogen, antagonist, or competitor) to suppress or control populations of pests. (Van Driesche and Bellows 1996 or the updated Van Driesche, Hoddle and Center 2008). Easy to say, difficult to do. The image to the left shows a praying mantis ripping apart an ant. An iconic moment of a large predator attacking a prey. Seems straightforward, but there is much more to it. Far more than our typical attention spans and impatient lifestyles allow us to perceive. How many of you noticed the small fly waiting in quiet repose just behind the head of the mantis? Wonder what it's up to? Most likely waiting for a meal for itself or to provide a meal for its yet-to-be-born offspring. More on that later. And what of the mantis? Its kind are typically associated with "environmentally effective pest control" or "green" approaches to killing pests. Other terms like "ecofriendly" & "biorational" crop up in association with mantids in pest management. 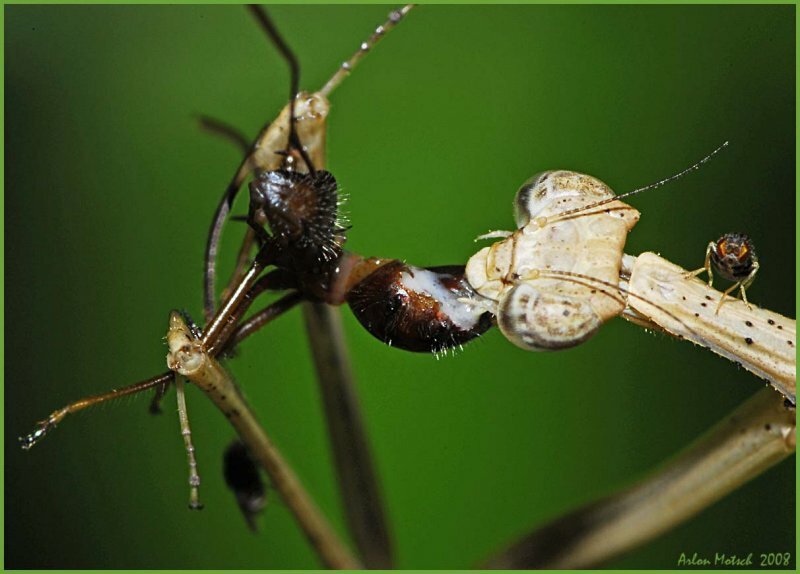 Would you be amazed...concerned...offended...if I were to say that mantids are one of the least effective predators for pest management and attempts to employ them in such tasks are ill-fated? In other words, it's a complete waste of money to purchase mantid egg cases at the hardware store for some pesticide-free pest management to make yourself feel good about being easy on the environment. The key for any practitioner of biological control is to have a deep appreciation for and keen awareness of natural control and the rules of predator / prey engagement. For it is these rules that you will be manipulating in the arena of man-made or natural ecosystems to restore and maintain balance among the interconnected constituents of that ecosystem. It is a noble pursuit, don't let anyone tell you otherwise. For a more comprehensive look at the concepts of biological control and practical guidelines for using the methods for pest management in a variety of settings, please see the new book: The Biological Control Companion, A Guide to Environmentally Appropriate Pest Management. Available at: https://www.createspace.com/5974008, And on Amazon Prime or Kindle: https://www.amazon.com/Biological-Control-Companion-Environmentally-Appropriate/dp/1523794852/ref=sr_1_2?s=fiona-hardware&ie=UTF8&qid=1469586201&sr=8-2&keywords=the+biological+control+companion, or for 1-month FREE KindleUnlimited. Disclaimer: I make liberal and unapologetic use of web images on this site. Some images are my own. Photographers that have been perspicacious enough to include their name/date/copyright will be recognized by having that information included with the photo and not cropped out. Some images are from Wikipedia, and thus I consider them fair game. This site is educational only. If you want to pursue copyright infringement because you see that I'm using one of your images and didn't ask permission first, I offer the following: 1. You have taken an extraordinary photo that serves a significant educational role and is one that I am not able to produce myself. Therefore, please consider it a complement and validation of your skills as a photographer. 2. If you put stuff on the ol' internet, it's pretty much out there for anyone to use and trying to invoke some copyright violation comes across as pedantic to me; just sayin'. Disabling "right click" is also just ridiculous, have you not heard of "print screen" "command-shift-4" or "screen shot"? Seriously. 3. Contact me if you're totally offended and I'll replace your image with one that is very similar because the "interweb" is literally littered with hundreds of duplicative images and then you'll be left out of the educational process. (C) www.biologicalcontrol.info. All Rights Reserved.